There have been more than 100 shootings in Boston since the Marathon in April. Think about that. If 100 people went to Massachusetts General Hospital with a mysterious virus in four months, we would treat it as an epidemic. There would be headlines, alarms, and calls for action. 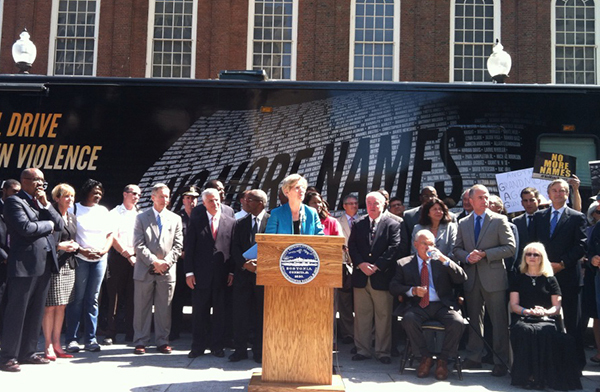 This week, I stood with Boston Mayor Tom Menino, Senator Ed Markey, and Mayors Against Illegal Guns at Faneuil Hall to demand stronger national gun laws. We’re not going to our call for action. Some people say that gun laws should be left to the states, but state laws just aren’t enough. We have some of the country’s toughest gun control laws in Massachusetts, but Mayor Menino has pointed out that an astonishing 65% of the guns recovered at crime scenes in Boston come from out of state. Unlike Massachusetts, nearby states like New Hampshire and Maine don’t require a permit or license to buy a gun, so people can buy guns there and drive back to Massachusetts with the trunk loaded up. Nationwide, only 60% of gun sales are subject to a federal background check because of the gun show loophole and other gaps in oversight. Background checks are a simple and effective step that would help keep guns out of the wrong hands, and we need to close the gaps. I know a minority of Senators blocked this bipartisan bill earlier this year, but I’m not going to stop fighting. Neither is President Obama, who just yesterday announced an executive order to close more of the loopholes. But too many loopholes remain. Our children are at risk. Until we have made our schools and our streets safer – here in Massachusetts and across the country – we’re going to keep talking about this issue. To join the call for action, visit NoMoreNames.org.